The full Kelly and Cogan Conservation Report may now be downloaded as a PDF by clicking here. In 2006 Cavan County Council amd the Heritage Council commissioned a conservation report by Kelly and Cogan Architects; a small part of which is reproduced here with their permission. Webmaster's note: The report is a very substantial document which will take some time to convert to web format. It may remain here in the history section of the web site or if complete it may be inserted under Preservation and linked directly from the home page. The relevant pictures and diagrams will be added as soon as possible. The visits, on which the following report is based, took place in November 2004. The authors carried out the survey and inspection, photographs were taken and measurements made with tapes etc. A large part of the exterior was not visible due to the extensive ivy growth and some parts of the interior were not safe to enter viz. Blocks B, G and J first floor. The Bawnboy workhouse was built in 1852 to the design of George Wilkinson, Architect. Wilkinson was born in Oxfordshire to a family of architects/ stonemasons in 1814. He made rapid progress at an early age and had built at least nine workhouses in the south and west of England before he was brought to Ireland by The Poor Law Commissioners for Ireland at the age of 25. The appointment of Wilkinson - an outsider- was extremely unpopular amongst Irish architects, giving rise to a long controversy that eventually led to the formation of the Royal Institute of Architects in Ireland. During the period 1840 to 1858 Wilkinson designed and oversaw the building of 163 workhouses throughout the 32 counties of Ireland, probably the greatest single building programme ever achieved in this country. After the workhouse programme was completed Wilkinson was appointed architect for the building of "Lunatic Asylums" at Castlebar and Letterkenny; he also designed railway stations for the Dublin and Kingstown and Midland - Great - Western Companies. His most significant building outside of the workhouses was the former Harcourt St. railway station designed in a robust classical style. He lived in Ireland until 1888 when he returned to England, he died in at Twickenham near London in 1890.
of the Irish Poor Law Commissioners. The earlier workhouses had almost universally been carried out to a single design concept prepared by Wilkinson and approved by the client in 1839. This was based on a plan configuration consisting of a central spine containing the common areas with a series of connected blocks / wings at right angles to the spine containing male and female accommodation and usually symmetrically organised. The whole complex was contained within walls forming a prison like compound. 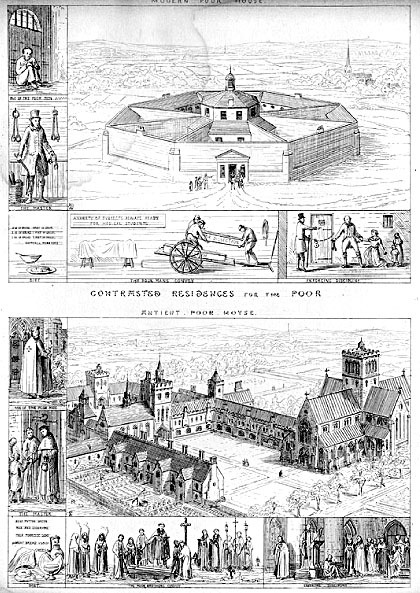 The early workhouses were referred to as Bastilles after the Parisian prison. The architectural treatment of the elevations in the first phase was in a Tudor style with high-pitched gable projections at the ends of blocks and stair towers with pyramidal slated roofs. (Ref. Figures 2 - 5) These buildings were almost all in local stone with cast-iron windows, timber upper floors and mortar / composition ground floors. The notable exceptions to this architectural style were those at Carlow, Killarney, Co. Kerry and Thomastown, Co. Kilkenny where the facades were classically composed. In the later phase, the architectural treatment was generally simpler; the Tudor gables were omitted; Wilkinson had amended the design to rendering the facades with lime render as a result of the criticism he had received arising from damp penetration through the walls in the earlier phase. Similarly, he had changed the design to use timber windows rather than cast-iron following problems with achieving good sealing around the windows. Wilkinson had, prior to coming to Ireland, designed 8/9 workhouses in the south­west of England. The English workhouses were built to a greater variety of plan type than in Ireland. Wilkinson's main achievement and principal legacy of the workhouse programme is in the clarity of the planning and the quality of the architectural detail. Wilkinson also became an expert on the building stones of Ireland and wrote a book on the subject using the research he had collated from the workhouse building programme; the book was titled 'The Practical Geology and Ancient Architecture of Ireland'. The site lies due east of Bawnboy village on land north of the road connecting Bawnboy to Ballyconnell. The Bawnboy Union was declared on 26th April, 1850 and subsequently lands of 12 acres purchased from J.D. Rochford. The first OS Map (1832-9) shows the site prior to the building of the workhouse. The new workhouse buildings were erected in the period during 1852-53 when the country was recovering from the Famine at a cost of £4,900.00 plus £945.00 for fixtures. It was opened in November, 1853. The building was designed to accommodate 500 inmates. The site was unoccupied prior to the building of the workhouse in 1852. The lands on which it was built lay within the demesne of Bawnboy House. The first Ordnance Survey maps of the area surveyed in 1837­1838 shows the site prior to the building. The site and buildings are aligned on a NE / SW axis, the front faces SW. The buildings are arranged symmetrically with women's accommodation on the left and men's on the right of the central axis. The shared facilities of Kitchen / Dining / Chapel are located on the central axis with access from both sides. Ancillary facilities of storage, toilets and refractories are located on both sides on the flank wall. The Laundry is located in the Women's' area and the Bakehouse in the men's area. Both men's and women's areas had workrooms on the ground floor of the dormitory block as also had the boy' area. The type of work done varied with the locality and the quality of the staff. In some areas the inmates received training in skills such as lacework, in general however, the work was basic physical labour such as breaking stones and picking 'oakum' (tarred rope) for reuse. One of the first decisions of the new Irish Free State in 1921 was to abolish the Poor Law Act; the remaining workhouses were amalgamated and in many cases converted to hospital use. The building in Bawnboy was closed and the remaining inmates moved to Cavan, Carrick-on­Shannon or moved home to relatives. It was later used as a vocational school and RC chapel in the 20th century. There have been very few alterations to the existing fabric, the principal one being the joining of the Dining and Chapel to form an enlarged RC Chapel, this use continued until 1979 when the new St. Mogue's Church replaced it. The installation of stained glass windows in the Chapel probably dates to c. 1954. The buildings are unused at present. There has been considerable loss of fabric through damage by weather, vandalism and lack of maintenance. * The webmaster hopes to make available the complete document in due course but for the present the descriptions of the individual buildings and the architect's recommendations for them have had to be omitted although they are now available in the full Conservation Report. The final sections of the report include Conservation Value & Guide-lines and Proposals for Re-use. Some of these are reproduced below. 5. Conservation Value of the Existing Structure. They are a physical historical document as they represent a memory of the most difficult time in the history of the Irish people. They are important in the history and origin of the architectural profession in Ireland. They were designed by Wilkinson an important 19th C. Architect. They are of importance in the history of the construction industry as their construction was the largest single building programme ever undertaken in Ireland to that date. They are part of a building typology that has now become a mater of sociological study - described by Foucault and others as buildings of containment and segregation. The issues arising from this are worthy of further discussion in the context of the regeneration of the buildings. Bawnboy is of considerable value because it is reasonably intact and contains interiors (especially the Laundry and Bakehouse) that are unaltered since the date of building. Therefore the conservation interest attaches particularly to those buildings with original features. The remaining fabric is to be treated as part of a historical document and should not be altered. The General Principles underlying Conservation of Historic Structures have been laid down in the international charters e.g. the Venice Charter and the Burra Charter. The work to the complex shall comply with DOE Guidelines for Conservation of Protected Structures. Any intervention in the form of new building should respect the physical context, the scale, proportion, massing, texture, materials and colour of the existing buildings. New interventions should not be replicas unless it is essential to the architectural integrity of the complex to replace the missing portion and that there is cleare vidence of its original form. To enable the buildings to have a useful life for the foreseeable future they will need to be adapted to achieve a level of usability. This will involve a certain level of intervention to provide modern levels of safety, comfort and utility e.g. services, thermal insulation, ventilation, fire safety, access for the disabled etc. that will be acceptable. These interventions may not accord with modem building practice or with the 'deemed to satisfy' parts of the building regulations but must achieve equivalent standards via alternative means. It is appropriate in considering a new Master Plan for a workhouse that the difficult social history and folk memory attached to them should be looked at carefully. The memory of the difficult period when the workhouse was built is an intrinsic element of its conservation value. The building is a Protected Structure. Therefore all of the relevant buildings, ancillary structures etc. within the curtilage of the site are protected by statute and may not be removed or altered without specific permission of the relevant authority having been obtained in advance. The following is a schedule of the essential aspects of the complex that should not be removed or altered without the consent of the planning authority. 1. The overall plan form and the boundary walls. 2. The existing lime dashed external walls. 3. The existing lime washed internal walls. 4. The stone walls to the ancillary buildings and external walls. 5. The existing windows and doors. 6. The stone surrounds to external and internal door openings. 7. The stone ventilator surrounds. 8. The stone external and internal window cills. 9. The cantilevered stone stairs and associated ironwork. 11. The stone corbel stones on south wall of Block E.
12. The timber stairs to blocks A, B, J. 13. The timber floors, beams, walkways and platforms. 15. The timber vertically sliding sash windows. 16. The timber side and bottom hinged pivot windows. 17. The timber boarded, ledged and braced doors external and internal. 18. The chimneys, fireplaces, hearths and associated ironmongery. 19. The remaining thumb latches and window catches and fasteners. 20. The built-in fixtures in the Laundry, Kitchen, Bake-house, Privies and Refractories. a. Space requirements and type of spatial sub-division associated with that use. There are several types of restaurant / café that could be accommodated within the complex. This use requires space for dining that would ideally be on ground floor with level access for disabled, with kitchens and ancillary storage / toilets etc all on the same level. A restaurant catering for groups up to 80 at any time would require an area of c. 100 sq.. m. for dining and an area of 6070 sq. m. for kitchen, storage and staff facility. The parking requirement could be accommodated easily within the space available. Access for deliveries and removal of waste could be accommodated. This use would be more viable if associated with other tourism and accommodation uses on the site. There would not be any special structural measures required for this use. If the opening season was restricted to Easter to October period then the environmental comfort level required could be achieved with relatively little alteration to the existing fabric by means of underfloor heating supplied by geo-thermal source. This use could be accommodated in the ground floor of any of the buildings. The former chapel / dining hall could perhaps best be adapted with little negative impact on its conservation value as it has already been significantly altered. Also .the ventilation and sanitary requirements of the kitchen could be arranged with minimal impact on the external appearance of the building. All of the buildings have high window cills	that limit visibility in / out. New floors with thermal insulation, damp proof course and Radon protection barrier. Reinstatement of roof slating and timbers. Reinstatement of windows, provision of secondary windows or shutters for improved insulation. Provision of disabled access accommodation on ground floor. Provision of new electrical, plumbing, ventilation and heating services. Provision of underfloor heating sourced from geo-thermal or other renewable source. Provision of thermal insulation to roof. This type of use has been recommended by the Feasibility Study Team. It is one that we are reluctant to endorse as it is our opinion that it does not offer a long term prospect in the future. It is our view based on experience that caravan parks tend to be short life and towards the end of their lives can be a source of problems of anti-social behaviour that would be unhelpful in this instance. There are no normal standards for caravan parks, they vary in size and in the space allocated per caravan depending on the market they are targeted at. The Fire Officer will require a minimum of 10m space between caravans for fire separation. The major requirement is for good road access, adequate hard standing areas for the caravan pitches and high quality common areas for toilets, showers, and eating and play activities for young persons. All of these can be accommodate on the site but do little to assist the regeneration of the buildings. Provision of road access, site lighting, mains services, foul and surface water drainage. Again this use is not one that has normal standards as the number of field study centres is quite small. In fact the Derrygonnelly centre in West Fermanagh is already in existence nearby and caters for the same types of study as those outlined in the Feasibility Study. The idea, however, is good and could be developed with slightly different angle e.g. outdoor pursuits, wind energy study, an Annnagh-makerrig centre for the visual arts. The accommodation requirement for this type of centre is for a minimum of 100 beds, subdivided to cater for groups of different sizes and gender and supervisory staff and with refectory type dining served from a 'self catering', kitchen with basic facilities. The centre requires 3 or 4 study rooms with good I.T. facilities for group learning. Back up facilities are showers, bathrooms, storage and drying of outdoor clothing and associated services and plant. This accommodation requirement could be met by taking Blocks A and B together and using Block C for communal dining / kitchen and storage areas. New ground floors with thermal Insulation, damp proof course and Radon protection barrier. Reinstatement of roof slating and timbers. Reinstatement of timber first floors. Provision of shower and bathroom areas. We consider that the provision of an Interpretative Centre in the sense of a major visitor's centre at this stage is non-viable. The type of interpretation provided should be ancillary to the other uses and the best practice is to conserve the buildings and allow them to speak for themselves. The excellent examples of their original design Laundry, Bakehouse and Refractories are that have had minimal alteration and with god repair and with conservation measures can be retained specifically for their historical and educational value. The other buildings should be retained with minimal change to their general character and with any new interventions clearly identifiable and genuinely reversible. Repairs to walls and render. Provision of discrete lighting to enable viewing. This use is in our view viable as it allows for some commercial re-use of the existing buildings that will hopefully generate more interest in the complex. We suggest that this use could be combined with some well designed new-build accommodation for tourism use. For this reason we would favour the former Infirmary building and the area to the rear as being most suitable as those buildings that still exist are in poor condition and can therefore be adapted with a little more freedom than the former dormitories. Provision of kitchens and bathrooms. Provision of fire separation between units and proper means of escape. Similarly to the above we believe that this is a viable use and combined with the other suggested uses will be a generator of income that will make investment in the complex worthwhile and sustainable. The accommodation requirement for this type of use can be combined / shared with the Field Study Centre/ Outdoor Pursuits Centre. The accommodation can be reasonably frugal as this keeps costs low and in some way retains the austerity of the original building function. Of course, the modem comforts in terms of bathrooms / shower areas must be provided to a high standard.